This tutorial demonstrates how to bounce audio in Ableton Live and explains the differences between resampling audio and freezing and flattening audio. At some point in your project, you may want to resample audio for various reasons. 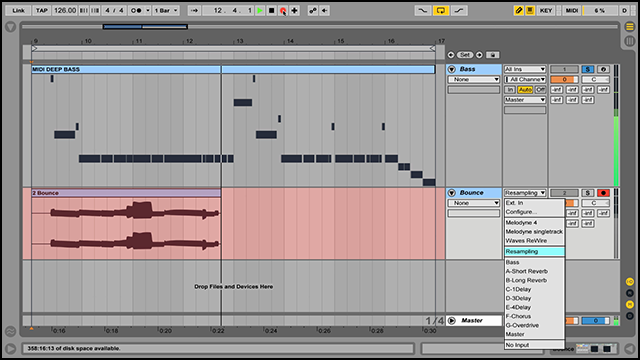 Ableton Live offers three ways to bounce source material to audio. You can export a track via Live’s ‘Export Audio/Video’ command, or you can resample audio using either the ‘Resampling’ command and the ‘Freeze Track’ and ‘Flatten’ commands. For this tutorial, we will look at the benefits of bouncing audio and then compare the differences of bouncing audio using the ‘Resampling’ command and the ‘Freeze Track’ and ‘Flatten’ commands. There are several beneficial reasons for bouncing audio. Below are just a few common reasons you may consider bouncing audio. Using a lot of instruments and audio effects in your project can quickly overload CPU resources. Bouncing tracks to audio is an invaluable approach to freeing up CPU usage or memory limitations. There are many more creative possibilities available when working with audio vs. working with MIDI. Audio is extremely flexible and allows you to do fun things in Live such as reversing, time-stretching, slicing, resampling, and many other artistic editing approaches. Bouncing tracks to audio commits your ideas and crystallizes your focus. 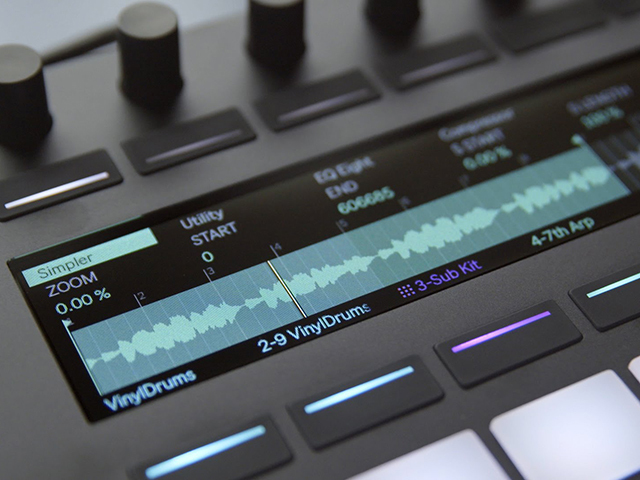 When working with MIDI, it can be easy to fall into a vicious cycle of continuously changing things, essentially slowing down your workflow. Committing your ideas gives you direction and momentum to move forward and complete projects. Having the ability to visualize audio waveforms is much more helpful than looking at MIDI notes. With audio, you can hone in on the waveform and make ultra-precise editing moves such as applying fades to remove pops and clicks, adjusting the timing, observing waveform levels, investigating sound problems, and more. Audio files are much more manageable and easier to save for future projects. In addition, you may want to work on another computer or collaborate with someone that may not have the same plugins you used or even find that you lost an instrument’s’ preset in a crash. Audio files ensure you always have your sounds ready to go anywhere and on any computer. Ableton Live offers a feature called ‘Resampling’ that is available from any audio track’s ‘Input Type’ chooser menu. This option allows you to record the output of one or multiple tracks into a new, editable audio track. This approach will give you an exact copy of source material with the same bit depth as the original or what is set in Live’s Preferences. Ableton recommends setting internal recording to 32 bits to ensure neutral recordings of plugin instruments and any audio signals that are being processed by effects plugins. Please note, that if the source audio is already at a lower bit depth, internal recording at that bit depth will also be neutral assuming that no effects are used. In addition, internally recording an unprocessed 16 bit audio file at 32 bits will not increase the sound quality. Also, keep in mind that the bounced audio will use the ‘Warp Mode’ set in Live Preferences which could affect the playback quality. When ‘Resampling’ audio, there are a few other things to be mindful of that can alter the results. The ‘Resampling’ option will route the Master output to that track. You can decide on what exactly will be resampled by muting or soloing the tracks that are feeding the Master output. Be aware of the signal path and the effects the signal is passing through before it reaches the Master output. For example, if you solo a track within a group and resample it, the results will capture any effects on that track, the group track, the Master channel, and any Return tracks that the source audio is sent to with the Send controls. If you only want the unprocessed signal to be resampled, first deactivate any effects along the signal path as well as any Return tracks. Setting up a track or a group of tracks to resample is fairly easy. You can bounce audio in either Session View or Arrangement View. Create a new Audio Track below the MIDI or Audio Track you would like to resample. Select ‘Resampling’ from the tracks ‘Audio From’ chooser menu. Arm the ‘Resampling’ track for recording by clicking the tracks ‘Record’ button. Solo the track or group of tracks you wish to resample. Enable the ‘Arrangement Record’ button in the transport controls at the top of Live’s interface to begin recording. Ableton Live has an extremely useful ‘Freeze Track’ feature that can greatly help manage the CPU load of your project or be used to quickly resample audio. Freezing a track temporary renders a pre-fader bounce of the tracks output signal which includes all devices and automation. The frozen track can be unfrozen anytime if you wish to make edits with the ‘Unfreeze Track’ command available from the same Edit menu. A frozen track conserves CPU usage because it will play back its ‘Freeze File’ rather than repeatedly calculating processor-intensive device and clip settings in real time. However, once a track is frozen, you can no longer edit clip settings, device parameters or automation. Although as a pre-fader bounce, mixer controls such as volume, panning, and send amounts are all still available to adjust or automate. The ‘Freeze Track’ feature can also be used to resample audio. You can commit a frozen track to audio by either creating a new Audio Track and dragging the frozen audio to the new track or by selecting the ‘Flatten’ command from the Edit menu to permanently render the frozen track to audio. Freezing and flattening tracks completely replaces the original clip and all devices with a new audio file. The rendered results will include any device or clip settings and automation. When Freezing and flattening audio, there are a few things to be mindful of that are different from resampling audio. Frozen tracks are rendered as 32 bit files and not the same bit depth as the original material, which ensures that they will not be lower quality than the audio heard prior to freezing. However, there are some special cases that result in non-neutral behavior and should be noted. 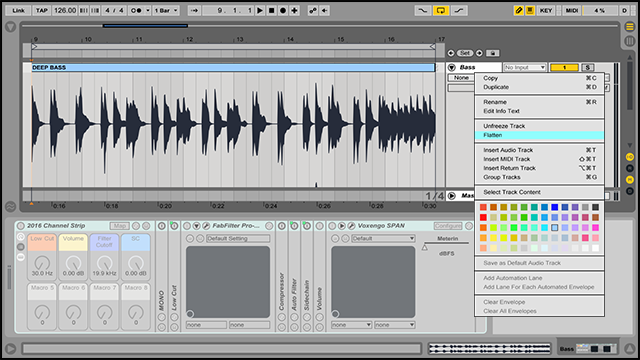 Frozen and flattened tracks in Arrangement View will include audio material that extends beyond the end of the clip itself, such as reverb tails and delay repetitions. Frozen and flattened tracks in Session View, on the other hand, will cut off audio material that extends beyond the end of the clip after freezing. In addition, frozen clips are always played back and rendered with ‘Warp’ on and in ‘Beats Mode,’ which means they are subject to the same non-neutral behavior as any other Warped audio files and may sound different from the original material. Bouncing audio with the ‘Freeze Track’ and ‘Flatten’ commands is less involved than resampling tracks. Below is a quick guide to achieving this method. Right-click any track you wish to bounce and select ‘Freeze Track’ from the Edit menu. Be aware that it is not possible to freeze a Group Track. Once a track is frozen, right-click the track again and select ‘Flatten’ from the Edit menu. Alternatively, you can create a new Audio Track and drag the frozen audio to that track.